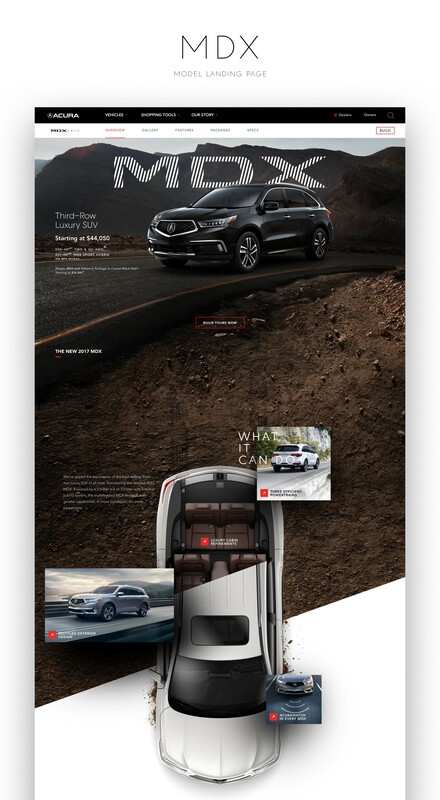 I had the pleasure to not only direct the content creation (CGI stills and video) for the MDX 2017 release but also creative direct the model landing page. Each new model needs to make a distinct and impactful impression while reflecting a consistent brand message. 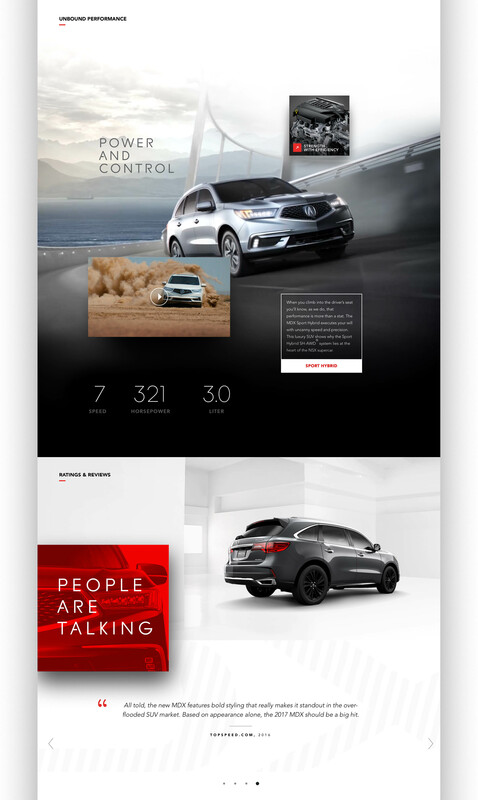 Our agency was tasked with a complete redesign of the customer facing digital presence for Acura vehicles on the web. With a mobile first mantra we utilized market research to guide our talented strategists, creatives and technologists to deliver award winning work. With energetic collaboration and highly communicative cross-team collaboration a vibrant creative process was fostered which allowed the best work to rise to the top. 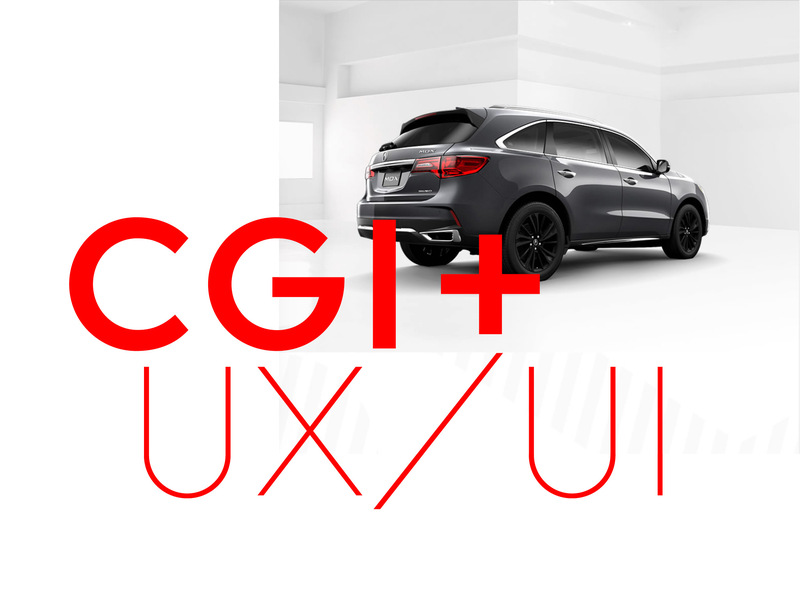 I worked as the CD to direct creative via the studio 3D Excite (a Dessault company) throughout the entire CGI content creation process—from shotlist creation, to angle hunting, color and shader definition, through final look & feel development. 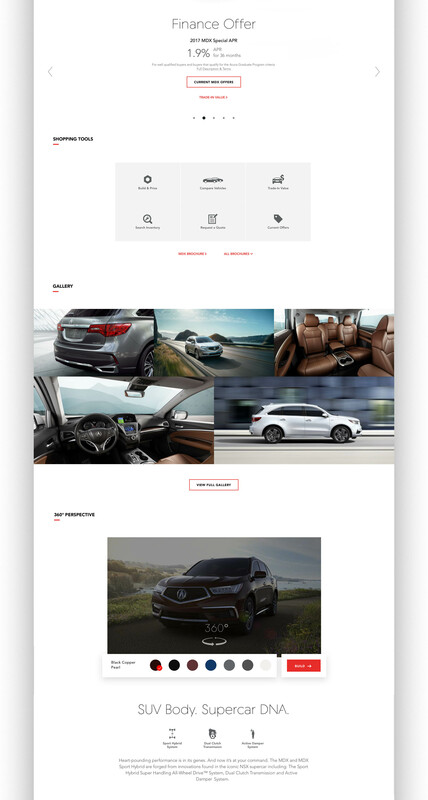 For the website experience design I worked with the client and my counterpart lead from UX. I lead my team of creatives to define a story-telling approach and final exectution based on the inputs from the client, the market-place and technical considerations. We had a highly talented team of ACDs, art directors, senior designers and copy writers. The duo who worked on the initial digital brand expression delivered an exceptional starting point. The ECD and GCD both played vital roles to ensure we had the right high-level direction with the right team and tools in place. The still photography was produced by one of our agency partners who responded to my supportive tenor by allowing me to submit shot lists based on our needs for the web experience. This paid off big with a cohesive final product delivered across all digital media channels. The mobile and tablet versions of the site were designed and executed with three major break-points in mind. We looked at the most used resolutions across desktop, tablet and mobile. We also looked a set of sample units within our target audience to ensure the most common screen resolution sizes were also used by the most important audience. With such an ambitious/experiemental layout approach there were many challenges throughout the final build process. We were determined to deliver the visual story-telling approach that both we were so excited about and the client signed-off on. I stayed engaged throughout the entire process. There was an art director dedicated to visual QA and played a support role throughout the final build stages to improve speed to market and speed to value.